1 Day Only! Notte's Slumber Shot, Now Live! Notte's really letting loose in the forest! 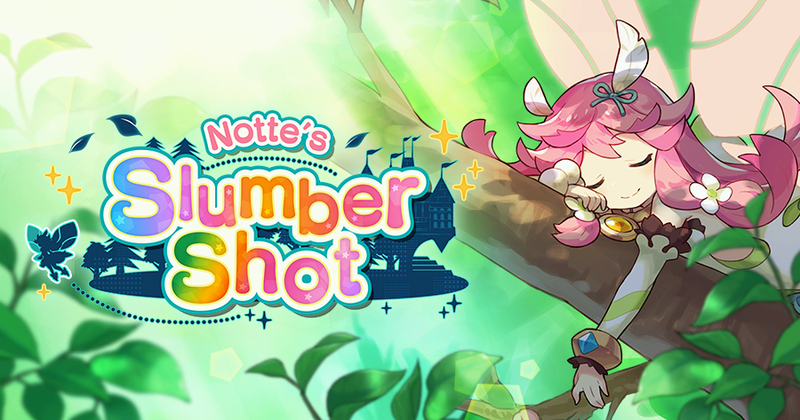 The too-cute-for-school Notte's Slumber Shot is now live! ・Whoa! Notte's the star of her own game?! Let's not worry about the why or the how, let's just set out on a heart-pounding adventure! ・Shoot water drops at the enemies that stand in your way to send them packing! Defeat the golden fafnirs that appear to find berries. Eating them will level up your water drops! ・You'll lose hearts if you're hit by an enemy attack, and if you run out, it's game over. But don't give up just because of a few bumps and scrapes! If you can hang in there when the going gets tough, you'll be able to recover hearts. ・But what's waiting at the end? Well, we didn't want to be the one to tell you this, but... It's a pretty big dragon. If you can evade its fierce attacks and take it down, you'll get a ton of sparkling stars. So get in there and aim for a high score! Notte is also giving the following presents to all players. We hope these prove useful in your future adventures! For players who log in before 10:59 PM Apr 7, 2019(PT)/ 5:59 AM Apr 8, 2019(UTC), this gift can be claimed from your goodie box for up to 7 days after logging in. Thank you for playing Dragalia Lost... And Notte's Slumber Shot!